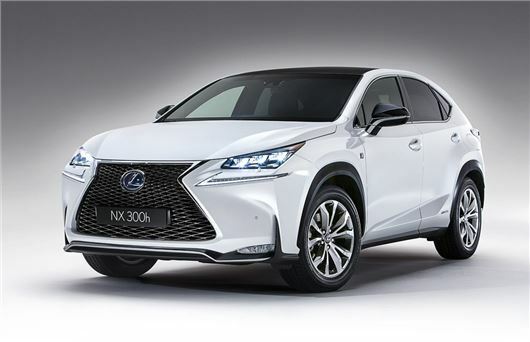 The latest crossover to enter the market - the Lexus NX - is now available to order. The first cars will arrive this October with prices starting at £29,495 for the hybrid powered NX 300h. In March 2015 a 2.0-litre turbocharged petrol model, the NX 200t, will be added to the line-up. Competing with the likes of the Range Rover Evoque, the NX is smaller than the RX 450h and will be the first Lexus to adopt a new turbocharged 2.0-litre petrol unit. Badged as the NX 200t it develops 235PS along with an impressive 350Nm of torque and is mated to a six-speed automatic. It will come exclusively as an F Sport model. The NX 300h uses the renowned Lexus hybrid system already seen in the GS 300h. It combines a 2.5-litre petrol engine with an electric motor to give a total power output of 195PS. Lexus is aiming for emissions of just 120g/km which would out it in VED band C and mean official economy of 54.3mpg. Five trim level will be available with the entry-level S model coming with front-wheel drive as oppose to the four-wheel drive of the rest of the range. The S also gets 17-inch alloy wheels, dual-zone climate control, DAB and the Lexus Media Display with Remote Touch controller. The NX will be the first Lexus model to feature a Pre-Crash Safety system and Adaptive Cruise Control as standard on all versions. Other firsts for a Lexus include a wireless charging tray for easy charging of mobile phones and a new Remote Touch Interface with a touchpad control. If this has decent kit levels in the price then it should sell well to company users. Speccing a European SUV adds just too much to the cost. Makes a refreshing change to the German three which suffer from being photocopies of other model ranges.